Standout Tidbits: Hmmmm… not so much. Review: Peppino’s is located in a standard, unassuming strip mall-style building that looks like it could have been built anytime between now and 1980. The state of the restaurant inside tells you that it probably opened closer to the 80’s, and the Peppino’s staff hasn’t changed anything or done any fixing up since then. I wouldn’t go as far as to say the place was dirty, but, it certainly wasn’t fresh and clean. The ceiling tiles were way past yellow and well into brown. The vinyl booths had deep dips in the seats. The ceiling fan had mismatched light bulbs and its blades were wilting more than the fake flowers on the tables. The team of older Italian gentlemen behind the counter didn’t do much to warm our hearts to this place. In fact, they didn’t do much at all besides guard the soda fountain against refills and pressure us to make a choice and move down the line. Along the line you can pick from the pastas, iceberg salads, or slices under the glass display. 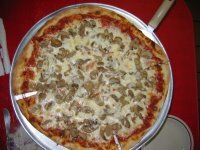 Customers can also order fresh, whole pies or calzones. We opted for a large za with mushrooms and made our way to the droopy booth. 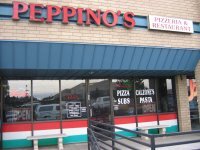 Although we were initially unimpressed with Peppino’s, we started adding things up. The pizza oven was well-used. There were thin slices behind glass. The guys behind the counter were grumpy. The table cloths were plastic and red-checkered. Had we stumbled on a true “old-school” pizza joint? Were we about to be treated to some great, East-Coast za? The pie itself was unimpressively fitting for the place. As soon as it arrived we were aware of the canned ‘shrooms. They were laid too thickly on the entire pizza and then buried under just as much cheese. Although the cheese tasted ok, it was overly chewy and too elastic when trying to separate one slice from the rest. Please don’t misunderstand me here. This was not like a nice, gooey slice where the hot cheese is almost dripping. This was closer to the consistency of stretched Silly Putty. Silly Putty that at least tasted ok. The canned mushrooms didn’t seem very cooked and were quite rubbery. Underneath them was a minimal amount of red sauce, which, like the cheese, tasted just ok. I really have no big complaints about the crust. It had a decent taste and wasn’t too crisp or too chewy. When we first arrived, it was early in the lunch period, and we were almost the only ones there. When we left, the place was about 60% full. The curious thing was that it didn’t seem like anyone was talking or enjoying their lunchtime. It just looked like they were there to eat out of necessity, before heading back to their hopefully more enjoyable jobs. 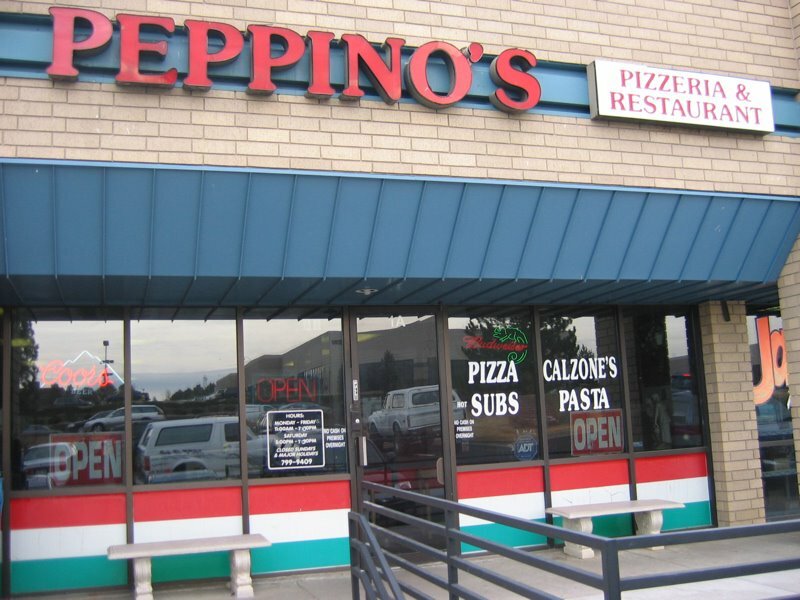 Overall, Peppino’s gets a sub-ok rating. 2 out of 5 whatevers (if we had a ranking system established). I have no idea how the pasta or calzones are, but I also have no real desire to go back and find out. This entry was posted in Forgettable, Thin Crust and tagged Bad, Traditional Thin Crust. Bookmark the permalink. I left Peppino’s with a feeling of loss and longing. I lost my lunch break and I was longing for some decent food. I thought the Pizza was Bland and tasteless. There was minimal sauce and the amount of mushrooms did not complement the pie. By no means do I put my pizza reviewing abilities in the same class as Gavin but I would have almost preferred a “Totino’s” $.99 pizza to the bland cardboard I ate at lunch.